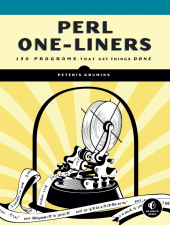 No Starch Press noticed that I keep talking about Michael W. Lucas’s BSD-related books, and I’ve linked to Peteris Krumins’s catonmat site before, so they sent a copy of Krumins’s new “Perl One-Liners” book to me. Here’s the hook for me: Perl was the first language I wrote a program of any real use in. Years ago, I had the Perl Cookbook. It was a pretty simple formula, where I’d have a problem. I’d look it up in the Perl Cookbook. If there was already a recipe that matched what I needed, I was set. I ended up having to stuff the book into a binder because the spine broke. This reference is essentially what the Perl One-Liners book is, though this is less about programming and more about the solution you need right now. The book realizes this and it’s laid out like a menu. Flip through the index to find your problem, and then type the answer. The book even includes a link to a text file that you can copy down and grep for answers – I won’t link to it because it’s not mentioned on the author’s page, though he does include example chapters. It’s not about learning Perl, and it’s not about technique – these are one-liners, after all. If you are doing the sort of thing Perl excels at, like text mangling, this will be a book full of tools for you. I think the author is going to continue in this style; he’s done a lot of one-liner articles and even some previous e-books. Probably a good idea to make this disclaimer: As with other books, I get no reward for this review, unless you count me having another book in the house. That’s more of a problem than a benefit for me.